@LiquidAlpinist Would the Sandisk Extreme you mentioned be these? Also want to chime in here. I replaced all of my Transcend gold cards (60MB/s Write) with the newer version of Sandisk Extreme 64GB (40MB/s Write). I'm running Cake on 3 GH2s and they all work flawlessly so far, after a number of paid gigs. I attempted to emulate the "file number limit" issue and I managed to create it. So, small file after spanning from now on. I'm going to test Moon T5 tomorrow, I think. See if I like it better than T7 for high ISO. We're not talking about Transcend here. Read the context. Sandisk Extreme Pro is what we were talking about. All SanDisk Extreme cards work with the hacked GH2. There was never any question that the U3 card would work in the GH2. Mine didn't. Even at a lowly 50 Mb/s, the Transend U3 card for the GH4 failed miserably on a hacked GH2. There was never any question that the U3 card would work in the GH2. UHS cards are all backwards compatible with HS mode. The only question is much more subtle, about the performance of the card for spanning with the highest bit rate hack settings, which only the 64 GB 95 MB/s SanDisk Extreme Pro cards seem to do. One more thing. I recorded a 7min clip and the card spans well. I got two files, one with the limit ~4.2GB and the second which starts right after that. I said earlier that I ordered a U1 card because I wasn't sure whether U3 will work or not. Well, Amazon sent me a U3 card... It works! I haven't recorded much, but on a two run trial I got the stats below from MPC and 4'20" correspond to 4.12GB of storage. I am using moon T7... I noticed something, though. The framerate seems to be variable? sometimes is shows 23.97, then changes to 24, then 24.25 and so on as you can see on the screenshot. Haven't noticed this before. On the card stuff, though... I guess we can assume that U3 labeled cards are actually the same as the U1 variants HW and FW wise, I imagine. I just put the card in, formatted in camera, started recording. Quick question, @frame mentioned that there is a bug of sorts about "file limit number" or something like that with 64GB cards. What did he mean by that? Yes I saw the date after I posted. It looks like Amazon combined the older U1 and U3 cards. Which is good sign that product is actually the same hardware, just updated specifications/rating. SD association announced the new U3 class rating for 4k video products in November 2013. Amazon has a search option when looking at the reviews on the bottom right side, with option to "search only these reviews". I put in GH2 and found many reviews. I also found many reviews on other random sites just through google. Thanks for the info. If I could be picky, the Amazon review was in 2012. However, the BH one is recent so I would guess that it should be fine. I'll get a U3 64GB one and see how it goes. Get back to you all when I get it. What is the "file number limit exceeded" issue? This is the first time I read about this. I decided to go for 64GB instead of 128GB because of the few repeated mentions that 128GB cards are too fragile to handle. Thanks. Look forward to hearing from you on which one you had! @hexagonal I bought one a few months back, so I'll check labeling on that and let you know. It works with hack settings that I was using and they were 80-110 Mb/s, with no problem. Either way you should be able to order from B&H with confidence of ability to return if it doesnt work because SanDisk said it is compatible with GH2. The GH2 doesn't support UHS mode, so of course the card is just going to work in HS mode, which has a signaling rate of 25 MB/s. UHS Speed Class 3 was only created recently. My guess is that the SanDisk Extreme Pro 95 MB/s cards with a UHS Speed Class 3 rating are identical to the older cards with a UHS Speed Class 1 rating, and that only the label was changed. The older cards are certainly performing above the level of UHS Speed Class 3. But the 64 GB one is the best performing one on the GH2, better than the 32 GB one. The 128 GB one could be different. Personally I use the 32 GB one because I don't want to deal with that "file number limit exceeded" issue of the 64 GB cards. If it has a class 10 rating, then it is at least compatible at that speed. Found this review on amazon for the 64gb U3 http://www.amazon.com/review/R27JYXV9F6XIC5/ref=cm_cr_rdp_perm?ie=UTF8&ASIN=B005LFT3UW "Great card and now my hacked GH2 can write data at 6x the legal AVCHD data rate, shhhhhhh don't tell." Found this review of the 128Gb U3 version. http://www.bhphotovideo.com/c/product/1082349-REG/sandisk_sdsdxp_128g_a46_128gb_extreme_pro_uhs_i.html "If looking for fast class 10 SD card for your Hacked GH2 this is it. With this card you can use all of the highest bitrate firmwares available. All forums on the subject say to use the 64GB extreme pro card but that is because they 128gb card wasn't available back when the GH2 hacks were being tested. This card will hold a days worth of shooting All-Intra. Best price from b&h, its like buying Bulk GB!" There is no more to discuss if the U3 will work. Just make sure it says class 10 and purchase it. On addressing a previous post on another thread (link below) on whether U3 64GB Extreme Pro 95mb/s will work with the GH2 the same as the U1 64GB Extreme Pro 95mb/s which have been available for a while, I got an answer from SanDisk about the query and, if it would work, then at what speed. Sadly enough, they still did not really address the question. I understand that you would like to know if SanDisk Extreme Pro UHS-I Memory Card of 64GB is compatible with your Panasonic GH2 camera. We have checked and found that your Panasonic camera is compatible with our card. You were requested the speed specifications of the card, and as we discussed before this card is a UHS-I card. Seems that your camera is not recognizing the U1 speed as you mentioned and performance is lower than you expect we cannot guarantee you that the U3 speed will have a good performance on your camera. It may be work fine with your camera, but the highest speed is not guaranteed as requested. However, we would recommend contacting the manufacturer of your device for further information prior to proceeding with a purchase. Since from our side this card has been tested successfully and should be working normally with your camera and provide you a good speed performance. For future reference, you can check SanDisk’s online Product Compatibility Tool; this application allows customers to verify if the SanDisk product that they intend on buying is indeed compatible with their device. The application also suggests all compatible products for a wide range of devices. That way you are always certain that the product you are about to purchase is compatible with your device. We remain at your service for any additional information." So, still no word on U3 compatbility. So I must buy SDXC or SDHC for latest Driftwood patch? That is good for Cluster DREWnet v9 Boom patch with "SPANNING" technique? I have one "Extreme" 45mb/s SDHC 16gb sometimes spanning fine with my tripod but getting freeze after moving light. Does anyone have experience with the new Sandisk Extreme 64GB (non-pro)? I just bought a Samsung Pro 64 card with 90read/80 write, for $60. The reviews on amazon seemed promising with some guys that ran tests on it. And it's listed as top value card on some German SD card testing website. I bought my GH2 used, already had a hack installed. I don't know which one but its recording at 149mb/s when using 24p. I wish there was a way to determine which hack was uploaded on it. I don't really want to mess with the firmware. @Magic815 I tested the Transcend card with 60 MB/s Write and 95 MB/s read, and it didn't work consistently on the hack setting I was using, which was Canis Skin Tones Soft. All the tests came back with a bitrate of 147Mb/s. The camera was able to do one 4 minute recording. Then I setup a different shot, and repeatedly it would stop after 5 seconds with an error regarding the SD card's write speed. So it may work with some of the hack settings, but for anything ~147 Mb/s and up, I wouldn't trust it for anything serious. (I was in fully manual mode, using a non-Panasonic lens that had no electronic connection to the camera.) I've read reviews that it handles the 100Mb/s mode on the GH4 just fine, so the card's capacity must be somewhere between 100-147 Mb/s. I'm going back to using the gold standard for GH2 - the Sandisk 64GB 95MB/s. The price just dropped to $91 at B&H and Adorama. 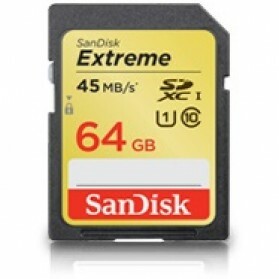 I ordered 2 of SanDisk 64GB Extreme Pro SD 95MB/s UHS-I SDXC Memory Card cards recently for my Moon 7 hacked GH2 and now i urgently need to upgrade to a GH4 camera setup for a gig. I wanted to know whether these cards work well without any freezes or issues on all modes of video on the GH4 including the 4K 100 mbps and FULL HD 200mbps modes? (attaching a pic of the cover of the card i have which has the exact model look and details on it. Awesome, I'd love to see your results. Good to know that the SDXC "file number limit" issue may not be that widespread. If I'm going to buy an SD, I'd prefer to go with the 64GB size. I just wanted to make sure it didn't still have known downsides to the SDHC 32GB version. @Magic815 I think the SanDisk 64GB 95MB/s card is still considered the gold standard. I used it for 2 years with no problem with various hack settings. But, I just ordered and received the Transcend 64GB card thats is 95MB/s read and 60 MB/s write because I've heard it does well with the hack settings and it only costs $35 (vs $98 for the Sandisk). I'll be testing it this coming weekend with a hack that comes in at ~100 Mb/s bitrate and will post my results.